Basic economics says that when demand exceeds supply, rationing is one possible solution. In the ISP world, this is achieved by traffic shaping and we believe it is a perfect solution as long as it is implemented in an open and transparent manner to customers. Plusnet, a mid-sized UK ISP recently acquired by BT, provides a possible template for all ISPs worldwide. Plusnet uses a combination of its Ellacoya and Juniper equipment to perform its traffic shaping. It is completely open and transparent with its current and prospective customers on how it achieves this. It is also very clear on the expected impact of the traffic shaping across a typical 24-hour window and what happens when the network is under abnormal load. Plusnet is also very transparent in how the network is performing and provides most of the data online delayed by 15 mins visible to all. The above actual example clearly shows P2P and Usenet traffic increasing when capacity is available on the network. The graph also shows that if people scheduled their P2P traffic overnight there is plenty of additional capacity available. 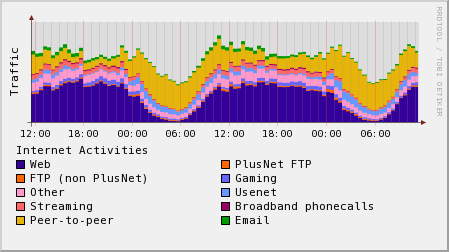 Plusnet also provides each of users a detailed view of how much bandwidth of which type they are consuming during the month. Plusnet tools even allow the user to inspect each packet to see how it is tagged and opens the possibility for users to provide feedback if tagging of a particular obscure service is incorrect. The net effect of all this openness and transparency is an increase in customer satisfaction which has been steadily growing during the 2007. Increased customer satisfaction feeds through onto the bottom line through reduced churn and increased sales referrals from its own base which is the Plusnet primary sales channel. Admittedly the Plusnet customer satisfaction was climbing from lows in 2006 which were partially of their own making: a combination of a disastrous port of its base to “up to 8-meg” products; and a few fat fingers running their email service. The end game of the traffic shaping is to put customers in control of each of every packet: not just in terms of prioritisation, but also in term of filtering. Obviously for non-technical users there will be standard templates. We think the Plusnet approach goes a long way to addressing the concern that traffic shaping is less about “serving the customer” and more about “screwing the customer”. No doubt none of the above is what network neutrality advocates had in mind: it can hardly be argued that Plusnet’s customers lack alternatives or are uninformed. However, we do not think that traffic shaping is the only possible solution to congestion and QoS issues. How will the costs of DPI equipment scale as you move to fibre? Would widespread use of traffic shaping cause users to game the system, disguising P2P traffic sharing as 2-way video? For an example of alternative approaches, Paris Metro Pricing is also worth a look, as it offering the user a carrot to get their content via more efficient means than peer-to-peer. You can read more about our views and those of survey respondents on ISP cost management in our soon-to-be-released Broadband Business Models 2.0 report.